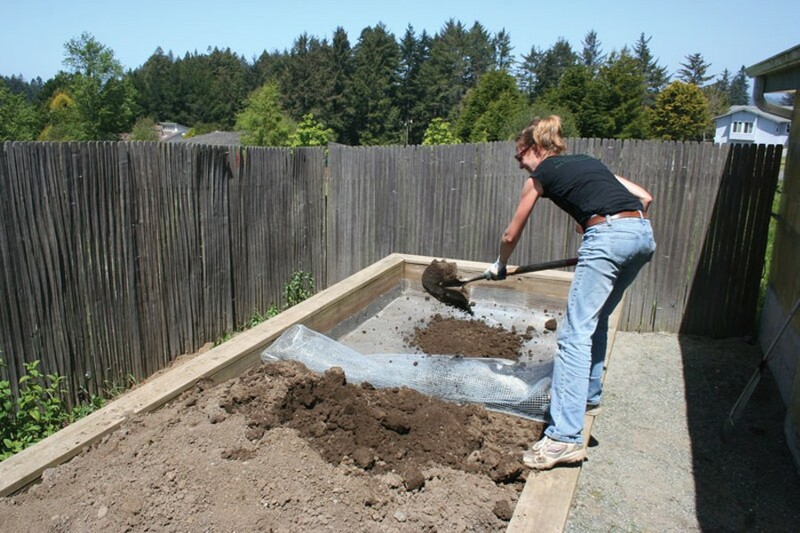 photo by genevieve Schmidt A FrIend of the Author gopher-proofs a vegetable garden bed. photo by genevieve Schmidt cute? 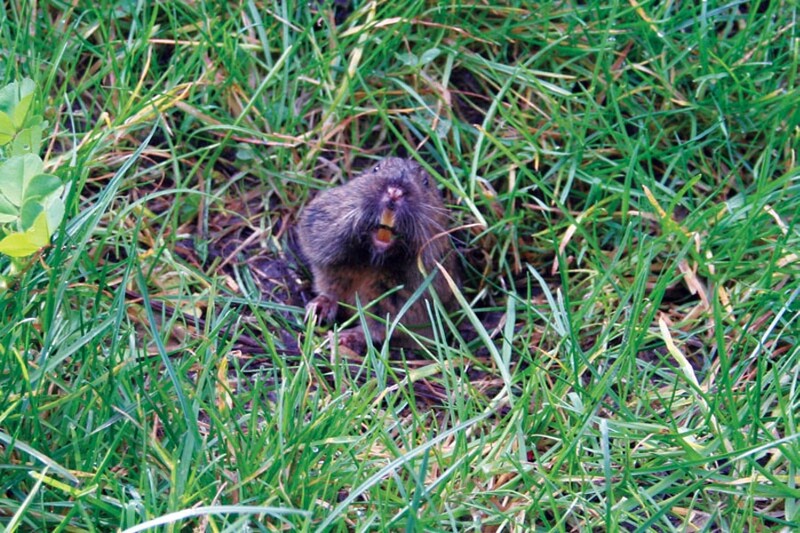 Whether you live in central Eureka or in the wild outskirts of Trinidad, gophers and moles can be found in just about any North Coast garden. While I would not recommend killing them, as they have as much right to the land as we do, after having hundreds of dollars of bulbs (true story) snarfed down by a hungry gopher or having your lawn ripped up by a mole in search of delicious grubs, you could be forgiven for hoping they might peacefully move on to that vacant lot down the street. What's a gardener to do? Is it a mole? A symmetrical, cone-shaped mound with some chunky clods of dirt and possibly an opening in the center is a good indication you have a mole. You also might see a raised ridge in the lawn, or a series of mounds along a curving line showing where they are traveling underground. If you have a mole, breathe a sigh of relief, because at least moles don't eat plants. They prefer to feast on insects, earthworms, and grubs, and are much easier to repel than gophers. Or is it a gopher? Gopher mounds have a fan- or crescent-shaped mound surrounding a 2- to 3-inch diameter hole. As a gopher digs through the soil, it pushes the dirt to the surface at an angle, so you'll find those irregularly-shaped mounds of soil surrounding each hole. The hole is usually plugged once the gopher finishes eating vegetation in the surrounding area. A lot of people are so annoyed by gophers and moles that they turn to using poisons, which are not only inhumane but can kill any cats or dogs who come across and eat the disoriented rodent. Or, they'll use an old-school trap which sends a spear through the center of your gopher or mole. That gives me the willies just thinking about it and is not the approach I want to take in the garden. However, using more natural methods requires patience and a little bit of Zen. Some amount of coexistence isn't necessarily a bad thing; they are cute in their way, and they do aerate your soil. The main idea is to make your lawn and landscape the least comfortable place on the block so they'll go elsewhere. There isn't one organic technique that is the magic bullet, and for that matter, poisons and traps require consistent use, as well. Rather than expect a one-and-done solution, choose a few techniques to use in concert with one another to chase them out and discourage new tunneling rodents from taking up residence. Flatten the tunnels and hope they dig deeper next time. Since moles aren't actually causing anything but aesthetic damage, I personally find them a lot easier to live with than gophers. If they are driving you nuts leaving raised tunnels and holes all over your lawn, just squash the tunnels flat with your foot. The moles will just come back, of course, but some people say that if you keep up with it, they will start digging their tunnels a little deeper as time goes on. Just keep a little bit of inexpensive grass seed on hand and scatter it on any disturbed areas of soil over your lawn. Remove their juiciest food source. A lawn studded with plump, succulent grubs is an ideal fine-dining situation for your local moles, and if your lawn has an excess of grubs, you can take care of this pest problem at the same time as you send your moles packing. Milky spore bacteria is a natural biological treatment which infests grubs and kills them. Because it is a targeted biological treatment, it won't harm any moles who eat the grubs or the beneficial insects in your garden, but by reducing the grub population, you may make your neighbor's yard look tastier than your own. Use a sonic vibration device. These small battery or solar-operated devices emit a periodic sound that humans don't generally notice, but is said to irritate both moles and gophers. Though it won't chase them out of your garden by itself, it certainly helps make your plot a less appealing place to set up shop. Spread castor oil granules. Granulated castor oil doesn't harm moles in any way, but when applied to the lawn (or landscape) using a broadcast spreader, it releases a scent that both moles and gophers dislike. If you have a large space, you can direct moles to the nearest exit by treating one third of your lawn, waiting a few hours for them to move along, treating the second third of the lawn and again waiting, then treat the final third of your lawn at the end of the day. If done in concert with removing their food source and using sonic vibration devices, you can expect a dramatic reduction in tunneling visitors. Both the sonic vibration devices and the castor oil granules mentioned above also irritate gophers, so consider those as the first techniques in your arsenal. Line your vegetable bed with hardware cloth. Hardware cloth is a tiny wire mesh much smaller than chicken wire, which gophers can't fit through. Dig down about 12 inches, carefully unroll the wire, bending it up about 8 inches on every side, and use a profusion of staples to thoroughly pin it to the wooden walls of your raised bed so that no gopher can get through from below. Then you can pile your soil over the top and garden in peace. Though gophers can climb over the top of a vegetable bed, in my experience they generally don't, unless your vegetable bed is low to the ground and set within a lawn. Encourage a little natural selection. Because gophers frequently come to the surface to nibble vegetation, they are easy prey for a hawk with a good line-of-sight place to stand. If you have a big enough landscape to leave any dead trees (or "snags") to naturally decompose, they provide the perfect hunting spot for a hawk. They love to perch on the top and survey their territory for any delicious rodents to eat. Stink up the joint with Alliums. Pretty much anything in the onion and garlic family smells disgusting to gophers, and though most of them aren't really practical plants to landscape with, you could certainly plant ample quantities of onions, garlic and leeks around your edible plants. Chives and a plant called society garlic (Tulbaghia violacea) are both attractive plants with lilac-colored flowers which can be used in garden beds around any plants which seem unusually susceptible (like dahlias, Phormiums and mallows). Donate your gophers to a local field. Catch-and-release traps are a decent solution for stubborn gophers, but they take quite a bit more energy on your part. It's best to set the traps as close to dawn as possible, and, because gophers will rightfully freak out once trapped, you'll need to do it on a day when you are home and can check the traps frequently. Then, when you're releasing the gopher into a wild area, you'll need to use a great deal of caution to make sure you don't get bitten. I don't think gophers feel any great sense of gratitude towards you after being stuck in a trap. Use gopher baskets with caution. Gopher baskets are commercially available baskets made of something akin to chicken wire which you can plant in to keep your plant safe. However, this is only a good solution for bulbs or flowering perennials, because woody shrubs, even something as small as a rose, can become root bound and develop a twisted root system which eventually leads to death. For a detailed monthly to-do list, visit www.northcoastjournal.com/GardenTodo. Genevieve Schmidt is a landscape designer and owns a fine landscape maintenance company in Arcata. Visit her on the web at www.GenevieveSchmidtDesign.com.